Onions are a plant bulb used in cooking for the flavour they add to food. Their taste can range from savoury to hot to sweet. If a recipe just calls for “onion”, it means a “Globe Onion”, which is the variety, yellow (aka brown) or white, that has become our unsung, workaday-hero onion for its pronounced taste and good storage abilities. Roughly, there are two types of onions: storage onions and sweet onions. That kind of distinction is very arbitrary, though — you could just as easily class them on shape or colour. 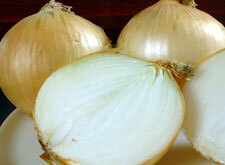 Storage onions — yellow or white onions — last well in storage, and add a savoury note to dishes. Sweet onions — such as red, Spanish and Vidalia — add a touch of sweetness to a dish. When buying onions, choose firm onions that are hefty for their size; don’t buy ones that have sprouted, or that have mould patches. Onions should be dry, not damp. The skin should be crackly and tight around the top. Onions are a member of Lily family. Onion growers class onions based on how many hours of daylight are needed to get them to form bulbs. Onions form a bulb when the temperature and the number of daylight hours hit the right combination for them which triggers their clock. Until that happens, onions use the daylight to produce a good deal of top growth before they form bulbs (and the more top growth, the bigger the bulb.) When the day reaches the right number of hours for that variety of onion, the onion will stop forming top growth, and form a bulb instead. Consequently, growers need to pick the right type of onion for how far north or south they are. See separate entries on Short-Day Onions, Intermediate Day Onions, and Long-Day Onions. The size of the bulb that eventually forms depends on the size of the “stalks”, and the number of them. There will be 1 ring in the onion for every stalk that formed, and the larger the stalk, the larger each ring will be. Bulb formation will pause though during dry, very hot or very cold weather. Onions are ready to pick when their tops have wilted, fallen over and dried out. After being pulled from the ground, they are generally left on top of the ground in the garden for a day or two to dry, if the weather is cooperative. Onions then need to be “cured” before storing. Curing takes about two weeks in a warm, ventilated area; they are ready to store when the outer skin is dry, and the necks are completely dry and tight. These onions are high in sulphur compounds and lower in water, so they store better, but have more zap to them. Usually best cooked, to sweeten them. Will have 3 to 5% sugar content. Generally, the more an onion makes you tear up, the better it will store. The opposite to Storage Onions is Sweet Onions; see separate entry. Yellow Globe (aka Brown Onions) can be classed as storage onions, as they store well. These are the onions that people mean when they just say “yellow onions.” Having a higher sulphur content than White Globe Onions, they are more likely to make your eyes tear up. They generally have a somewhat longer storage life than White Globe Onions. They also caramelize better than the white ones, becoming a richer brown. Their flavour also changes to sweet and mild when carmelized. Inside the onions have a yellowish tinge. Sometimes, they are called “Brown Onions” in reference to their brown skin. 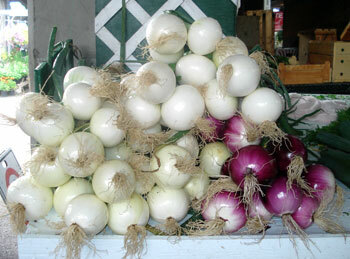 White Globe Onions are also classed as storage onions. These are the onions that people mean when they just say “white onions.” They have a tangier, less complex taste than yellow onions. When you are barbequing, toss peelings from onions onto hot coals while cooking for a wonderful, aromatic smell. Even keep a few onion skins from previous peelings in a bag in the freezer so you have them on hand for this. There’s absolutely no point to this, granted, beyond making your neighbours slather from the aroma. Cooking onions at high heat will just dry onions out and burn them, as well as making them taste bitter. A low heat, medium at the most, will sweeten them and keep them moist. Several solutions for peeling onions in a tearless fashion have been suggested. Peeling onions under running water has been suggested by some people (who clearly aren’t on a water meter.) The most effective one seems to be wearing goggles while you are doing it, to prevent the fumes from reaching your eyes. But most people just grin and bear it. You may read that onions chopped in a food processor won’t cook properly. They cook fine. To chop or slice an onion manually, peel it first. Then slice it in half vertically, so that each half has part of the root in it. Just make one slice, either top to root or cross-wise, depending on how you want the slices to end up. When finished, slice off the root end, and the slices will separate for you. See separate entry on chopping onions. Cut an onion in half, and juice it with a lemon juicer. Leeks, green onions, chives, shallots, dried onion, onion salt, onion powder, asafoetida. Onions contain sulphur compounds, and these in turn contain something called pyruvic acid: it is this that causes tears to flow and stomachs to get indigestion. 1 pound = 500 g = 4 – 5 medium onions = 3 large onions = 2 to 3 cups chopped, depending on how coarse you chop it. In fridge, store onions in a plastic bag for 5 days. To store cooked onions, put in a sealed container in fridge for up to 5 days, or freeze. Don’t store chopped onion, either fresh or cooked, in a metal container or bowl as the onion can discolour the metal. Do not store chopped onion in oil, even in the fridge, for longer than 3 to 5 days. The risk is botulism. Oil is not a preservative: in fact it provides the perfect oxygen-free environment in which any Clostridium botulinum spores present can germinate. Onion does not need to be blanched before freezing. Dice the onion, put on a baking sheet and put in freezer. When frozen, break it up and put into freezer bags. For long term storage, drying is perhaps the best way to preserve onion. See our companion site, Healthy Canning, for our dedicated page on drying onion . Use for seasoning in cooked dishes. To can onion, a pressure canner must be used as they are a low-acid food. A tested process was developed only for onions of 2 to 3 cm (1 inch) in diameter; the process does not apply to larger onions, even cut up. The tested directions appear in the food preservation book, So Easy to Preserve. For an online version of these directions, see here (link valid as of July 2018). Drying yields a higher and more versatile product. In a root cellar type environment, you can store most onions (not Sweet Onions) for at least 3 months — longer under ideal conditions. Store out of bright light, as light can cause them to become bitter. Don’t store near potatoes, as the gas that potatoes give off can shorten the onions’ storage life. If onions sprout in storage at a time of year when they can be planted out, and you have gardening space, instead of discarding them plant them for a continual supply of free green onion stalks to snip. They can also be planted in containers. Onions have been grown since at least 3000 BC in China. They are probably native to central Asia. The children of Israel mentioned them as one of the things they missed about Egypt. Onions were very much a part of Roman diet, though later on the upper classes saw them as peasant food. Romans introduced them throughout Europe. Apicius includes them in his recipes, though sparingly — Leeks were seen as more acceptable to eat. Diocletian’s price controls (301 AD), which by the way failed, included onions. Onions were seen as “peasant” food during the Middle Ages. “And, most dear actors, eat no onions nor garlic, for we are to utter sweet breath; and I do not doubt but to hear them say, it is a sweet comedy. No more words: away! go, away!” — Bottom. A Midsummer Night’s Dream. Act IV, Scene 2. Shakespeare. Shall in despite enforce a watery eye.” — Shakespeare. The Taming of the Shrew, Prologue. The hulls or skins of certain vegetables, on the other hand, are always burned, never disposed of in any other manner. I have known households where the women made a great show of saving onion peelings, which were carefully gathered up and burned in the fireplace or the cookstove. One woman told me that people who throw onion peel out on the ground are likely to suffer some financial reverses, and that she knew personally of a case in which carelessness in this matter caused a Civil War veteran to be deprived of his pension.”  Randolph, Vance. Ozark Superstitions. Columbia University Press, 1947. Chapter 4. 2. ↑ Randolph, Vance. Ozark Superstitions. Columbia University Press, 1947. Chapter 4.